The Chilli Padi Derby Grrrls (CPDG) is South East Asia and Singapore’s first not-for-profit women’s flat track roller derby league. The league is founded on September 2010 and is run by a group of professional and passionate women on a voluntary basis. CPDG has grown from a humble beginning of 3 players to 30 since September 2010 and hopes to gain national and international competing standards. The league also aims to be affiliated with American’s Women’s Flat Track Derby Association (WFTDA) and begin competing nationally in 2012. Roller derby is a contact sport played by two teams of five members roller skating in the same direction around a track. Game play consists of a series of short matchups (“jams”) in which both teams designate a scoring player (the “jammer”) who scores points by lapping members of the opposing team. The teams attempt to assist their own jammer whilst hindering the opposing jammer—in effect, playing both offense and defense simultaneously. 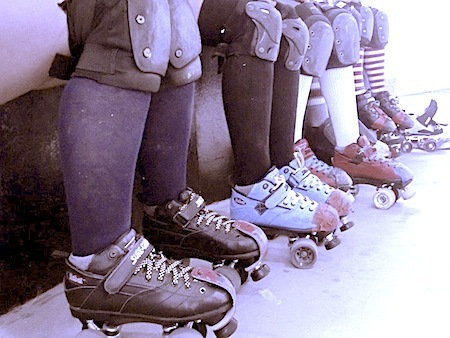 Modern roller derby is an international sport, dominated by all-female amateur teams, in addition to a growing number of male, co-ed, and junior roller derby teams, and was (as a roller sport) under consideration for the 2020 Olympics. Another kickass training coming up tomorrow! We'll see you 1130am at Stadium mrt! Just 3 more sleeps till our next training session! Sunday, 1130am at Stadium mrt station! See you there! Last Sunday we had Vicious Von Doom from DC roller girls join us for a fun (and undoubtedly warm) session! Thanks for the neat drills you shared with us, Vicious!